Last night while I was watering the back garden pot plants, I noticed that the mealy bugs have infested the hibiscus. They have been the bane of our gardening existence. Especially since we can't use chemicals due to the birds and because Fred eats hibiscus flowers. I will say that THIS is not the kind of ant farm I like to watch although it was interesting in a "bugs are interesting kind of way." 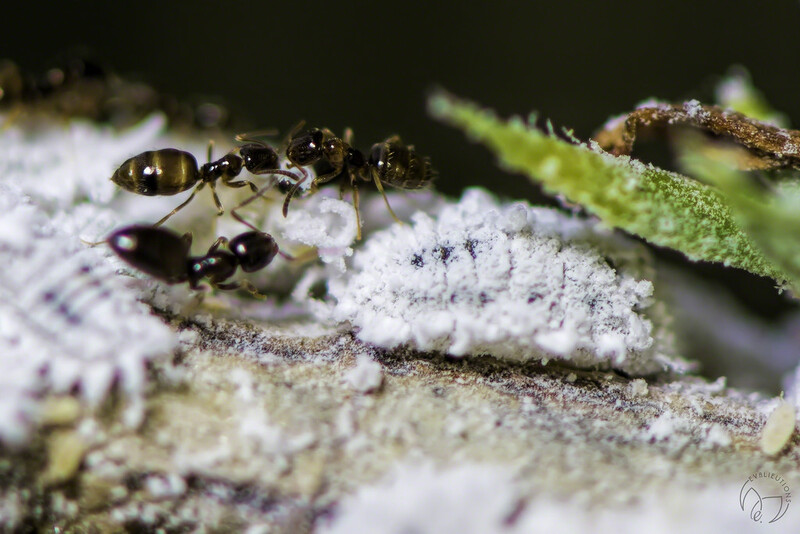 Can you see the wee tiny drop of honeydew being carried by the right-hand ant? Fascinating picture. Too bad there weren't any ladybugs.